"An indulgence of fries, gravy and cheese. A Canadian specialty!" See how to make French fries and cheese smothered in flavorful gravy. Add cut up cooked chicken or hamburger. Use shredded mozzarella cheese in place of cheese curds. 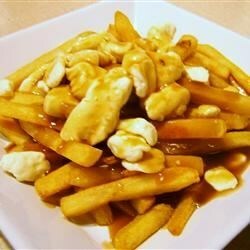 Italian Poutine: Substitute marinara for gravy. BBQ Poutine: Substitute a light BBQ sauce for gravy. Love this recipe! You can use mozzarella cheese if you can't find cheese curds, and packaged gravy mix if you can't find canned gravy. THIS is poutine. Ditch the canned gravy and use fresh beef gravy. Soooo gooooooood!! !